We all dream of having skin that doesn’t age, wrinkle or damage, but unfortunately this isn’t the case. While many of us fear anti-wrinkle treatments, The Harley Clinic has multiple tips and tricks that allow you to control the process. Young youthful skin is full of collagen that keeps your skin plump and elastic. As we age, the structure of the collagen weakens and becomes less elastic. Additionally, sun damage as well as all the smiling, laughing, squinting and frowning we do places greater stress on the production of collagen, thus producing fine lines and wrinkles. What are the best ways to prevent the ageing process? There are multiple things that we should be doing to protect and prevent our skin from damage and it all begins with a healthy skin routine. At The Harley Clinic we recommend that you remove any make-up before going to bed. It is important that you cleanse morning and night, and apply a moisturiser suitable for your skin type as well as using an SPF30+ sunscreen daily. Additionally, applying anti-ageing serums (rich in vitamins such as vitamin A, B and C) and using face masks regularly will leave your skin feeling supple and glowing. What treatments are available and how long do they last? If you find that you have been using these preventative methods for years and you are ready to take the next step, The Harley Clinic can guide you with a free skin consultation. 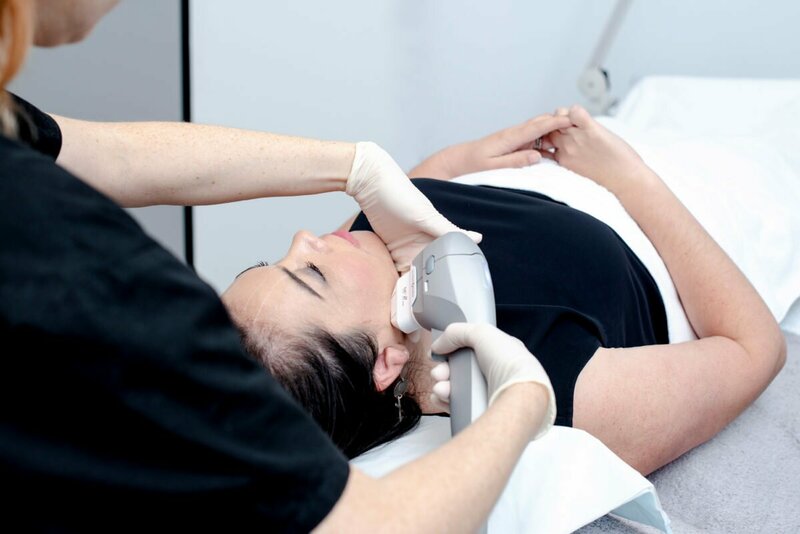 Our highly trained clinicians will complete a thorough review of your current skin regime and build a targeted treatment plan to ensure you start seeing improvements in skin texture, tone and health. A non-surgical face-lift is a procedure that aims to restore your skin’s texture and facial definition, making you appear more youthful. The Harley Clinic uses only the latest technology – including Ultraformer III. Ultraformer targets your skin at four different depths, thereby assisting in the stimulation of collagen while tightening your facial muscles. We suggest this treatment be repeated after three months. This will extend the life of the results. After these initial treatments we recommend a 12-monthly review and possible re-treatment to ensure the constant stimulation of collagen. An anti-wrinkle treatment at The Harley Clinic involves a thorough evaluation of your skin and personal goals. Our medical team has years of experience and training, ensuring that you not only receive the best outcomes, but your safety is paramount. We only use premium products that are approved for use in Australia. Anti-wrinkle treatments generally last between 3 to 4 months. To ensure you maintain a more youthful appearance we recommend you book in for treatment at these intervals. Rather than smoothening and tightening the skin, dermal fillers are designed to restore volume loss that occurs as we age. Dermal filler can be used in many areas of the face and can subtly rejuvenate your midface, lips and jawline. At The Harley Clinic, we only use premium dermal filler and all of our cosmetic injectors have years of experience injecting these products. Again, safety and outcomes are of paramount importance when it comes to these treatments. Typically, fillers last between 6 to 12 months. At The Harley Clinic we tailor your treatment journey to provide you with the results that you desire. Most importantly we want you to feel happy and confident in your own skin. Our experienced medical team will undertake a comprehensive consultation with you to discuss your desired outcome prior to making any suggestions or commencing any treatment. This entry was posted in Anti-Wrinkle Injections, Dermal Fillers, Non-Surgical Face-lift, Ultraformer III. Bookmark the permalink.